There are lots of people digging through the latest Ed Snowden leaks concerning the black budget for intelligence activities in the US trying to pick out various nuggets. Over at Wired, Kevin Poulsen has found one of the most interesting tidbits, highlighting how James Clapper cheers on the "groundbreaking cryptanalytic capabilities to defeat adversarial cryptofgraphy and exploit internet traffic." 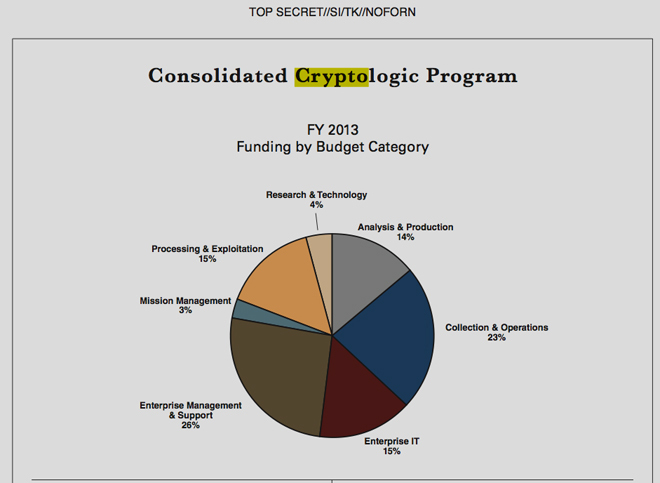 In short, the NSA has gotten pretty good at breaking encrypted communications. Encryption is a strong protector, but can be broken -- and that's always been a part of the NSA's mission: code-breaking. But, there have long been questions about to what level the NSA can break today's popular encryption standards. What today's leaks show is that they're apparently pretty successful and are spending more and more money on it: The pie chart above? That's $11 billion and it employes 35,000 people. Breaking your encryption. As Poulsen notes, James Bamford (who has followed the NSA closely for years) revealed last year that the NSA had recently made an "enormous breakthrough" in cryptanalysis, and this should raise some questions about just how secure various forms of encryption really are today. Re: Oh yes, please, tell me I'm wrong. It bring back the question of what is the enormous breakthrough. Probably not that significant - but you need to demonstrate some success in order to maintain funding.